So, this whole paleo thing. 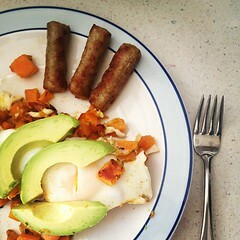 I’ve gotten several requests through IG to blog more about paleo and I’ve been meaning to, man have I been meaning to. I just knew that it would be a lengthy post and wasn’t sure when I’d find the time to adequately cover it. Considering that the last time I even blogged about it, other than my sweet potato hash post, was in Octoberwhen I was only 3 days into trying it, I’d say that I’ve got some work to do! As a starting point, the paleo diet [caveman diet] is based on eating clean, nutrient rich food from the food groups our hunter-gatherer forbearers would have had access to. These foods include fresh meat, fish, seafood, vegetables, fruits, seeds, nuts and healthy oils. What it does not include are dairy products, carbohydrates [cereal, grains, bread, pasta, rice], legumes, refined sugars and processed foods. I covered it a bit in October, but I’ve always tried to eat “healthy.” Of course, this has meant one thing or the other over the years, based on whether or not I’m training for something or trying to limit carbs/sugar/fat. It almost has always included relying on Lean Cuisines, reduced fat salad dressing and [insert processed diet food here]. This has been entirely different though and honestly, a little bit of a struggle for our family, because Tony doesn't have as much vision to cook paleo meals, so the cooking has fallen squarely on my shoulders. Tony went with me in the diet change in October and lost almost 10 lbs. Levi’s wedding and staying in a hotel for 4 days while traveling definitely threw us both off a bit, of course it was then Thanksgiving, quickly followed by Christmas and to boot we were in the throes of hockey season! It’s no wonder that my midwife called me out on my weight gain in December. What a roller coaster I was putting my body through! I gave up on Tony sometime in late January I believe and have just been going it myself since. When I initially made the change in October, I lost 2 lbs. 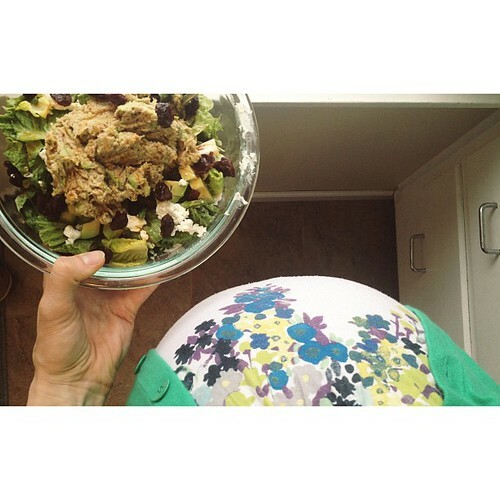 Being pregnant, I definitely was not trying to lose weight and kind of cautiously started to make the changes, but intended to quit if I noticed a continued loss. After that loss though, I kind of hit a patch of maintaining which was perfect, until Nov/Dec. After our WI Dells trip, I threw myself back into it and again had a small loss before finding a steady weight, which I have slowly, but regularly gained from over the last 12 weeks. After the initial 2 days of headaches and upset stomachs, Tony and I were pretty much raving to each other how awesome we felt with the new diet. I mean, it really doesn’t get much simpler than what we were doing, eating whole food. No boxes, cans or containers for the most part, just simply fresh meats, veggies and fruits. The taste couldn’t be beat and we could tell that our bodies were responding to the change. We had energy, clear skin, less gassy, were regular . . . you name it, it seemed to be a “side effect” of our food choices. Due to this, it’s been very easy for me to continue the last few months. For any of my pregnant friends, did you catch that happy “side effect” listed above? Constipation? Complete thing of the past. Because I love moderation as well, I’ll be the first to admit that I eat a little too much greek yogurt and goat cheese to really be considered on a dairy free diet. Additionally, we still shop at Aldi. While our health is of utmost importance to me, I knew that significantly changing our grocery budget to include grass fed meats and ritzier options was not going to happen. I always read my labels and sometimes am sadly shocked to find what additional crap goes into some items, but other times am happy to see it’s just as clean as can be. It works for us. In reading back on my previous blog posts nearing the end of pregnancy, I’m shocked by how much I had to complain about! I have easy pregnancies and I know I do! And yet, all I have to say at the end is how miserable I am. It’s made me really pause to reflect on the fact that, while yes, I’d kill for a good nights sleep, I feel so much better at this point! I really think it has to do with the food choices I’m making and that I’ve gained almost a 1/3 less this time than with Isaac and Ezra. Seeing as how Baby Sweets has continued to grow on track and was even measuring a week ahead at one point, I think it’s fairly safe to say that that’s 9 lbs less of me! And that 9 lbs less of me is equating to less pain, less discomfort and less overall complaints. I’m really excited to see how this diet effects my post partum recovery as well. Both in terms of weight loss and with baby blues. I know that baby blues are caused by hormone changes, but I can’t help but wonder if choosing the right foods for my body can’t juice up some endorphins to combat the negativity. Time will tell. This is inspiring, Leah! I have been kicking around the idea of going gluten free for our family for awhile. I'm wondering if it will help our kids in certain areas but for some reason I just get frozen when I try to consider the drastic diet change. 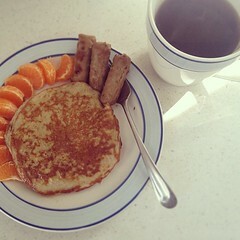 Although we eat relatively healthy, giving up starch and breads just seems so...hard! ;) I'm glad i hopped on your blog today as I just came on the computer to quickly look up some gluten free recipes to try. Keep up the great work, you are looking great. Can't wait for your baby girl's arrival! Although we don't eat Paleo, we've made the shift from the "diet" (i.e. fat free, pre-packaged) foods back to full-fat foods, and it has made a big difference! When I use raw-milk blue cheese, I'm satisfied with much less (and it tastes much better!) than the fat-free blue cheese crumbles of the past! I said it before but I'll say it again. 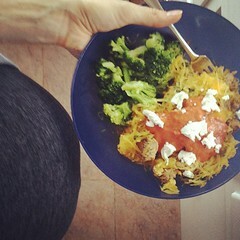 You have totally inspired me to change my eating habits when I am pregnant with #2. I am so mad at myself for eating whatever I wanted with E...and I have the stretchmarks forever to remind me. I've never been big into sweets but definitely need to quit with the processed crap. We eat pretty well around here but I think I need to tighten up in the bread/grain/cheese areas. Thanks for your tips! You look amazing! Leah, I follow you on IG as well, and I've been interested in this lifestyle after watching your yummy food posts. I've been wondering, though, how sausage fits into this diet (processed meats??) after seeing lots of it in your photos. @MissMolly nope! No insult taken. :) I know that for some clean eaters what we consider allowable due to our monies would never fly, but it's still cleaner than we used to eat and we can definitely tell the difference! Also, there are a lot of grass fed clean sausages, just not the ones at Aldi.